Everyone knew these political horror plots were possibilities, but brainstorming ways to fix the problem has mostly resulted in a gubernatorial game of “not it.” Neither Andrew Cuomo nor Chris Christie wants to deal with the price tag on such an ambitious infrastructure project, and the fact that the tunnels exist in a confusing netherworld under the Hudson and between both states means questions of cost and responsibility were inevitable. Schumer’s plan for how to fix the stalemate, which he announced in a speech at New York University on Tuesday, is to create a nonprofit corporation called the Gateway Development Corporation. Such a plan would bring together funding options available to New York, New Jersey, the Port Authority, the Metropolitan Transportation Authority, Amtrak, and the federal government — plus private money — and spread responsibility among as many actors as possible. “Amtrak can’t access federal mass transit funding,” Schumer said. 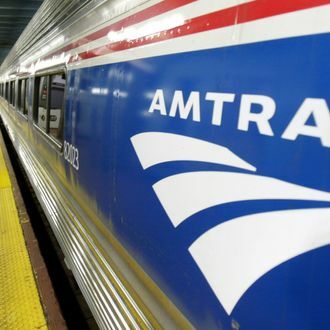 “The Port Authority and regional Transit Agencies can’t access federal railroad dollars the way Amtrak can. We’ll only get Gateway done by adding up several pieces of financing, with an eye toward getting the maximum amount possible from the federal government.” Schumer also proposed that Amtrak profits from the Northeast Corridor be used for fixing that rail line instead of helping fund less busy routes elsewhere in the country. The possible price tag of the project — more than $20 billion — and looming worries about having to use loans to finance some of the repairs had Christie and Cuomo limiting their reaction to the plan to a regurgitation of what we already knew about their feelings on the project: They’d better not be the ones expected to foot most of the bill. It was not clear if Schumer has had any luck in the past few hours coming up with imagery more frightening than “transportation Armageddon” to help jump-start talks on his plan, or whether he has resorted to adding “winning the lottery,” “buying a fleet of metal detectors,” and “finding El Chapo and making him build new tunnels” to his list of funding possibilities.